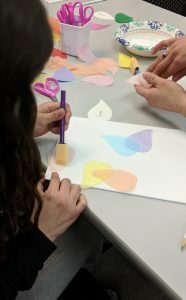 Twenty-three children who have experienced neglect or abuse in their young lives made decoupage pinwheels on canvas as part of NewBridge Services’ Second Annual Child Abuse Prevention Month Family Art Night. Parents and other caretakers took part in the event, held April 1 in NewBridge’s Sparta location and April 2 in the NewBridge Parsippany Center. The nonprofit’s Child and Family Services department reinforced parenting skills that help adults develop the confidence and resiliency to properly care for children. “It’s so important for parents to build a support network they can turn to in tough times, and to educate themselves about child development so they can anticipate changes in children’s behavior as they grow,” said NewBridge Child and Family Services Program Director Nicole Bolognini. “Parents and caretakers who develop good problem-solving skills are able to get through difficult times, so the family can thrive,” said Bolognini, a licensed clinical social worker. Last year, NewBridge helped 437 abused and neglected children and their families. Data released in January showed the number of children who were neglected or abused nationwide decreased slightly between fiscal years 2016 and 2017. Three-fourths of victims were neglected, 18.3 percent were physically abused, and 8.6 percent were sexually abused, according to the 2017 Child Maltreatment Report issued by the U.S. Health and Human Services’ Administration for Children and Families. New Jersey saw a 19-percent drop in child abuse cases between FY 2016, with 8,264 victims, and FY 2017, with 6,698, the report showed. Artwork made by children in NewBridge’s program will be on display at the nonprofit’s Sparta and Parsippany offices throughout the month. 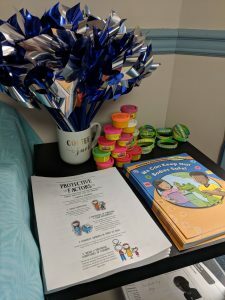 Participants enjoyed and pizza and dessert, and each went home with a blue pinwheel, the symbol of Child Abuse Prevention Month, Bolognini said. “By bringing awareness and skill-building programs to the community, we can support families at risk, helping them build social connections and knowledge of parenting,” said NewBridge Services Chief Operating Officer Michelle Borden, a licensed clinical social worker. Child abuse can be prevented when families receive support and interventions are available. The U.S. Department of Health and Human Services’ 2019 Prevention Resource Guide includes tip sheets for parents covering an array of parenting issues.